On Saturday, 10th November 2012 a group of DDAS members travelled down to the Open University in Milton Keynes to go on a tour of the Planetary and Space Sciences Research labs. On arrival we were directed to the Robert Hooke Building and there met Dr Richard Greenwood, who specialises in the analysis of meteorites. After being fortified with tea and biscuits we were given an excellent lecture on meteorites by Richard and the work being done by him into their origins. 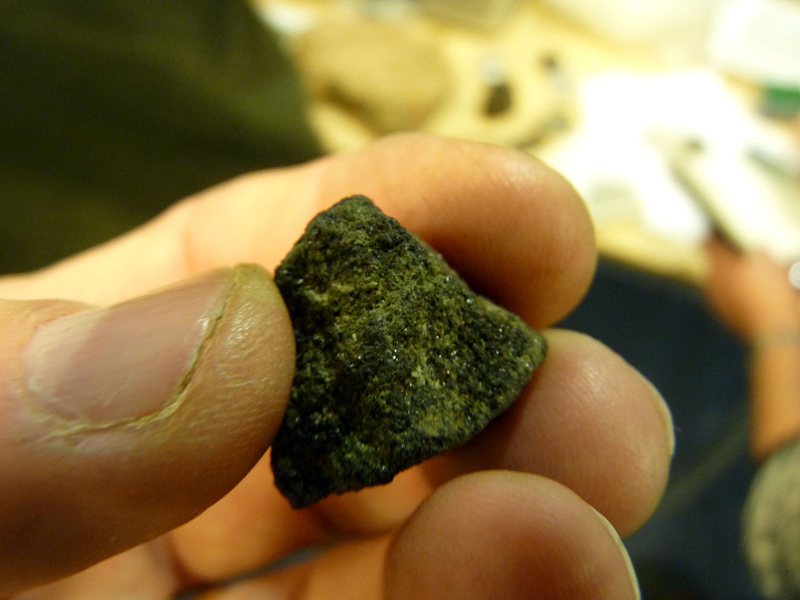 This was followed by a chance to actually hold and examine a number of meteorites from the research collection there. DDAS member Graham Ensor had also brought along some of his own specimens. Especially thrilling was the chance to hold a piece of Mars no less – a small specimen from the famous Nahkla meteorite which fell in Egypt in 1911. Other samples included nickel-iron meteorites, chondrites and a pallasite. Can you just open your cases for me sir? No this isn't airport security - Dr Richard Greenwood prepares to show us some real live meteorites from the OU collection. Photo by Tony Barker. Dr Greenwood introduces DDAS members to some of the OU's meteorite collection. Photo by Mike Dumelow. Meet a piece of Mars. A specimen from the Nahkla meteorite that fell in Egypt in 1911. One of the SNC group of Mars meteorites this Nahkla sample is a piece of basalt blasted off the surface of Mars by an ancient impact. Photo by Graham Ensor. A nickel iron meteorite that has been cut to show the metallic crystal structure. Such meteorites must have originated from the cores of long vanished planetary bodies that were large enough to undergo chemical differentiation - that is the heavy elements nickel and iron must have sank to the centre of such early planetoids. The core material was then liberated by later impact events. Photo by Tony Barker. Next on the agenda was a tour of some of the labs where Richard and his colleagues do their research. We started with donning gloves and foot covers and entered a small clean room where we had a look at a chondrite in thin section under a microscope in both plain and polarised light. Such examinations provide information on the mineralogical make-up of meteorites and important evidence into their origins. Glovely! Into the clean room we had to cover our hands and feet... Photo by Tony Barker. Examining a thin section of chondrite meteorite under the microscope in both plain and polarised light. Photo by Graham Ensor. The chondrite seen in polarised light. Chondrites are the most primitive of meteorites and comprise the oldest material in the solar system. It is believed they condensed directly out of the nebula in which the sun and planets formed and have undergone little or no differentiation since. This class of meteorites is named after the chondrules that they contain. The chondrules are round grains which formed in the solar nebula as free floating molten droplets. Chondrites also contain silicate minerals rich in iron, magnesium and calcium. Photo by Tony Barker. 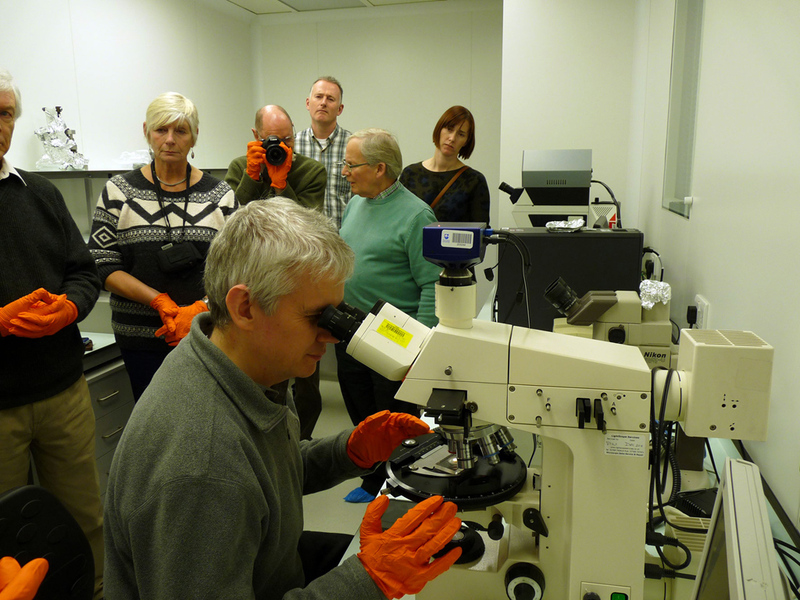 We then had a look at the equipment that Richard’s team uses to extract oxygen isotopes from meteorite samples. The ratio of oxygen-17 to oxygen-18 found in meteorites provides a useful measure in their classification, and can help in discovering the origin of meteorites which may otherwise have quite similar geochemistry. In this equipment small samples of meteorite are placed in special metal container and heated by a powerful laser, while also being exposed to bromine hexafluoride. The fluorine in this noxious chemical drives out the oxygen present in the meteorite. The liberated oxygen is then passed through a convoluted filtering apparatus before being sent to a mass spectrometer. It is the mass spectrometer that provides the ratio of oxygen-17 to oxygen-18. Laser flourination equipment for extracting oxygen isotopes from samples of meteorite. The oven-like metal box contains the laser and sample chamber while the complicated plumbing in front is the oxygen clean up line. Photo by Mike Dumelow. Close-up of the sample chamber which houses the meteorite to be analysed. Photo by Mike Dumelow. The MAT-253 stable isotope mass spectrometer that measures the oxygen isotope ratios. Photo by Mike Dumelow. The laser fluorination analysis is a bulk rock extraction method which looks at the whole sample of meteorite. To provide a quantitative analysis of individual minerals within a meteorite a different approach is used. So we were introduced to the OU’s Cameca SX100 – a French built ‘off the shelf’ Secondary Ion Mass Spectrometer. 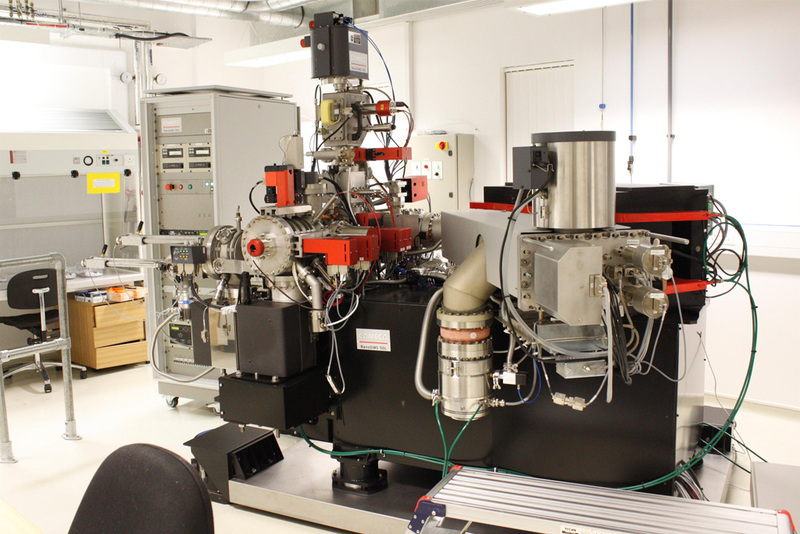 This large and expensive piece of kit can analyse individual grains in a section of meteorite. The Cameca Nano-SIMS secondary ion mass spectrometer used for analysing individual grains in a section of meteorite. The final piece of equipment we had an opportunity to see was the university’s focused ion beam - scanning tunnelling electron microscope (FIB-SEM). This is also used to analyse individual minerals within a sample of meteorite but has other uses. For example it has been employed in studies of dinosaur fossils where it has been possible to reconstruct the colouration of some feathered species by analysing the colour forming structures within pigment cells. The Quanta focused ion beam scanning electron microscope (FIB-SEM). Photo by Mike Dumelow. 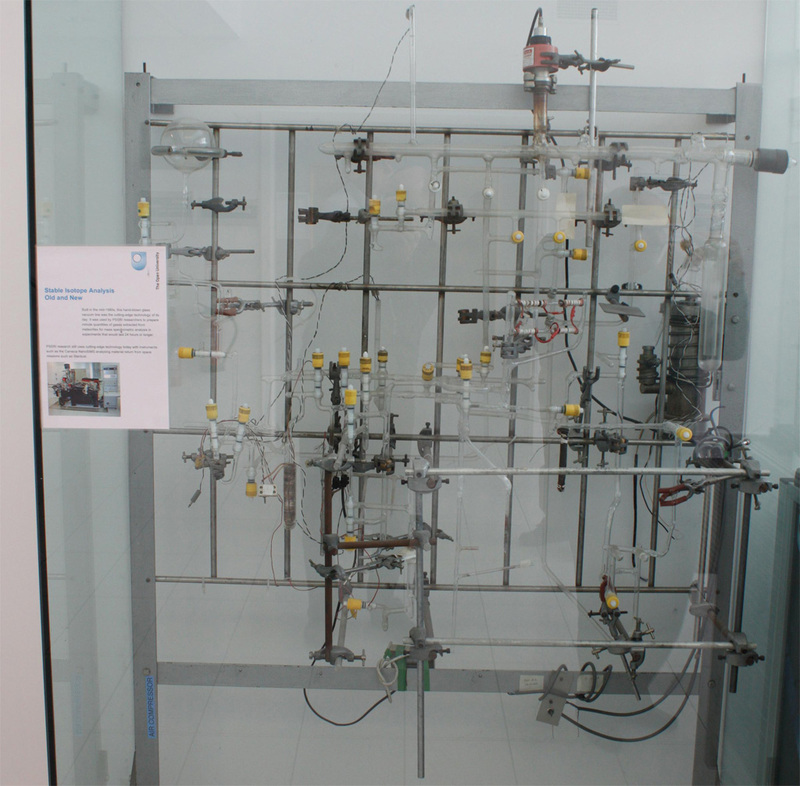 Before leaving we paused to look at a piece of research history in the form of an intricate hand-blown glass vacuum line which was used in the 1980s by OU scientists to prepare gases extracted from meteorites for analysis. Photo by Tony Barker. We would like to thank Richard Greenwood for his time and hospitality and providing us with a fascinating tour of the meteorite research facilities at the OU.